Hartin, a 34-year veteran advisor, said the project is her first to stretch to 20 years; it will likely extend past her tenure with UCCE. At the end of 2019, with three years of data on tree health and growth rates, the scientists expect to be able to publish the first results and make them available to arborists, urban foresters and residents throughout the regions of the study. Twelve tree species were selected for each climate zone in the comparative study, with several area parks used as control sites. Hartin and her Southern California research collaborators – UCCE advisors Darren Haver of Orange County and Jim Downer of Ventura County – worked closely with UC Davis plant biologist Alison Berry, UC Davis research associate Greg McPherson and USFS research urban ecologist Natalie van Doorn to select promising species. They looked for trees that are already available at local nurseries, but are underutilized. The trees in the project exhibit drought tolerance and disease resistance, plus produce minimal litter. The researchers also sought trees that would provide ample cooling shade for a long time – ideally 50 years or longer. The varieties come from areas around the world with climates similar to California. 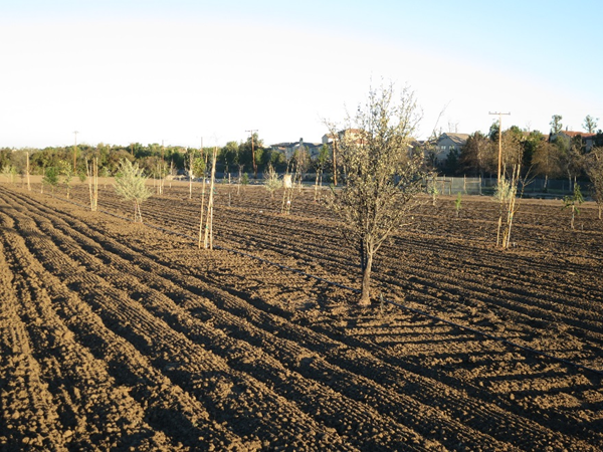 Two trees planted in replicated plots at the UC Riverside Citrus Field Station are native to Australia, two are native to Oklahoma and Texas, one is native to Asia and two are non-native crosses of other trees. 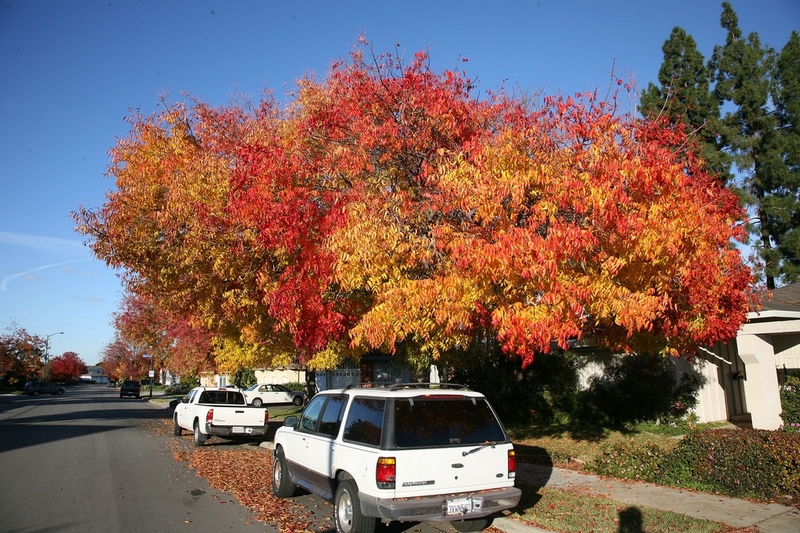 Three of the trees are native to California: the netleaf hackberry, Catalina cherry and island oak. Making the long-term investment with the proper selection yields considerable returns. In a warming world, trees are natural air conditioners. “Urban areas create heat islands, with dark asphalt surfaces reradiating heat. Cities can be 10 to 20 degrees warmer than the surrounding environment,” Hartin said. Other tree benefits include soil health and stability, wildlife habitat and aesthetic beauty. Acacia – A 20-foot-tall, 20-foot wide evergreen that is drought resistant, and withstands moderate irrigation. Native of Australia. Blue palo verde – A tree that reaches about 25 feet in height, the Blue palo verde is drought resistance and lives 50 to 150 years. Its trunk, branches and leaves have a blue-green hue. Native to the southwestern U.S. and Mexico. Brazilian cedarwood – A native of Brazil and Paraguay, the deciduous tree grows to 50 to 65 feet. The tree produces pale yellow tubular flowers in the spring. Catalina cherry – Native to the chaparral areas of coastal California, the Catalina cherry grows to 30 feet high. The evergreen tree tolerates drought when mature. It produces sweet purple-to-black edible fruit. Chinese pistache – A deciduous tree with beautiful fall color. Grows to 35 feet tall, 30 feet wide. Drought resistant, but tolerates moist soil. Native to central and western China. Desert willow – Growing to 30 feet tall and living 40 to 150 years, the desert willow tolerates highly alkaline soil and some salinity. A deciduous tree, it boasts large pink flowers all summer that attract hummingbirds and other wildlife. Native to the southwestern U.S. and northern Mexico. Escarpment live oak – Native to west Texas, this tree is cold hardy and drought tolerant. Typically evergreen, it can be deciduous in colder climates. Ghost gum – Very tall at maturity and drought tolerant. An Australia native. Indian laurel – Commonly called a ficus, this is a 35-foot-tall, 35-foot-wide tree at maturity that is drought resistant and tolerates highly alkaline and saline soils. Shade potential is high. Native of Asia and Hawaii. Ironwood – A southwestern and northern Mexico native, Ironwood is semi-drought resistant once mature and tolerates alkaline soil. Ironwood, which grows to about 33 feet tall, can live 50 to 150 years. Island oak – This tree is native to five of six California off-shore islands. Drought tolerant, it grows to nearly 70 feet tall when mature. 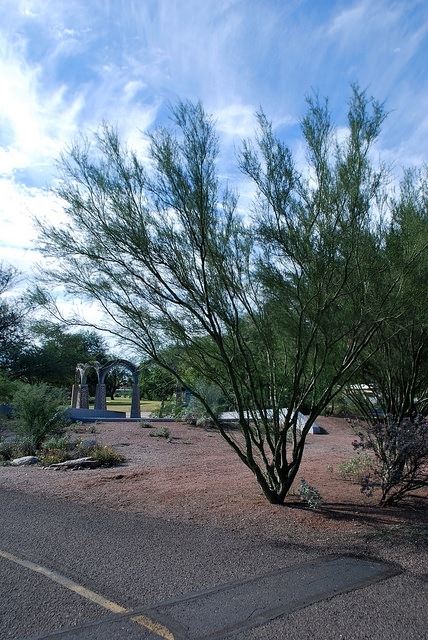 Maverick mesquite – Native to the southwestern U.S. and northern Mexico, this tree does well in full sun and is drought resistant once established. The tree grows to 35 feet tall. The Maverick mesquite is a thornless variety. Mulga – A versatile and hardy tree that grows 15 to 20 feet in height, the mulga – a Western Australia native – tolerates hot and dry conditions. The leaves are evergreen and the tree has yellow elongated fluffy flowers in spring. Netleaf hackberry – A California native, the netleaf hackberry grows to 30 feet. Its deep root systems and heat resistance makes the tree idea for urban conditions. Climate-ready trees planted in 2016 at the UC South Coast Research and Extension Center. Rosewood – Native to southern Iran, Indian rosewood grows to 65 feet tall, and 40 feet wide. Evergreen. Semi drought resistant and intolerant of alkaline soil. Shoestring Acacia – Evergreen and 30 feet tall when mature, shoestring acacia is drought resistant and thrives in slightly acidic to highly alkaline soils. Native to Australia. Tecate cypress – A native of Southern California and Mexico, the Tecate cypress is very drought tolerant. Its foliage is bright green. Young trees are pyramidal in shape, becoming more rounded or contorted with age. Partners in the tree study are Los Angeles Beautification Team volunteers, LA Parks and Recreation team, Chino Basin Water Conservation District, and Mountain States Wholesale Nursery. Funding and other support is provided by LA Center for Urban Natural Resources Sustainability, ISA Western Chapter, Britton Fund, USFS Pacific Southwest Research Station, and the UC system. I think this is really great and really important. Thanks for doing it. Please use the botanical names of the trees--there are many species of Acacia! I love many of the native trees on this list and I've planted them myself (especially I recommend the Island Oak of California) but it's a shame when I contemplate that we even have to cope with such rapid climate change. I don't know about the survival of the vegetation that requires more moisture; I've seen our seasonal creeks and streams dry up, and it could be really rough sledding, worse than now, for our plants and wild animals. Inherited a common Hackberry more than 55 years old on a property that we purchased 11 years ago. large tree with swooping down turning branches withstands high temperatures and the Santa Anna winds Located in the San Fernando Valley suburb of Los Angeles 91306. In addition to drought, soil & wind tolerance information, when publishing results, please also include fire resistance information. Thanks. Can you please provide the botanical names for all the trees? Acacia means nothing. Thanks! Please send the botanical names, CV, SSP and Species. Thank you for this study. I am sure you worked hard on this but it is entirely useless without the scientific names. There are over 15 trees called "ironwood." Furthermore if by "blue palo verde" you mean Parkinsonia florida then you have the wrong species in your image. And anyway, Parkinsonia X 'Desert Museum' is a far better choice of any Parkinsonia - being of hybrid origin it still blooms but doesn't litter with seeds. The one at the LA Natural History Museum is doing quite well. I'm surprised you didn't include in your street tree study the most drought resistant, insect resistant, fire resistant, tree of all ..... the Afghan Pine, commonly known as the Mondel Pine. One of the extra benefits of this tree is that it has a long central tap root making it ideal for street trees that won’t pick up the sidewalk and can be used on slopes to hold back soil from earth slippage. The long tap root can easily grow to 200 feet down to seek out a water source. It takes only 7 years to reach a height of 50 feet from a one foot planting container! Glad 3 out of 4 of our trees are on the list. What about crape myrtles? They’re planted all over Santa Clarita and we have one as well. It's great you are doing this study. I concur the scientific names are very important to know. Two thoughts: The city of LA keeps taking down healthy established 50-80 year old Ficus trees that were planted last mid-century due to sidewalk uplift and the lawsuits they cause. The Ficus is a known entity as a street tree and has a mixed history, so why include it in your study? Also why NOT include the esteemed Coast Live Oak (Quercus agrifolia)? The CA native Coast Live Oak should be in more nurseries, and the leaf litter is good for the tree, so needs not to be cleaned up. Even with climate change native plants might fair better, and your research can at least see that out. Hi all, thanks so much for all the great comments! Many tree species that you've suggested are already 'tried and true." A major goal of our study was to look at less commonly planted species to add to the diversity of available species.